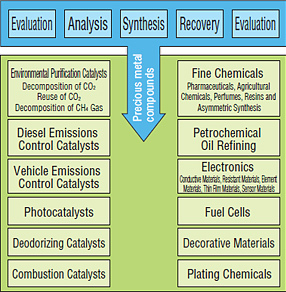 Precious metal compounds are used as plating chemicals and catalysts in various industrial fields. We manufacture an array of compounds, from commonly used compounds, such as potassium aurocyanide and palladium chloride, to complex organic precious metal compounds, to suit various applications, and supply them utilizing our reliable quality control system. 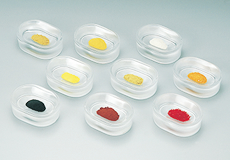 Stable supply of precious metal compounds for plating etc. 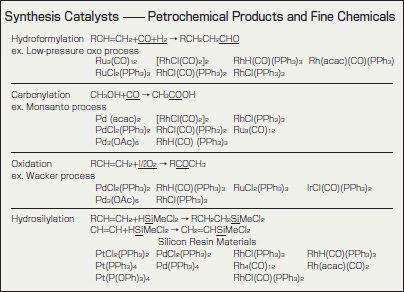 Various organic precious metal compounds are available for use as homogeneous catalysts. *Please inquire regarding mass production. Various other types are also available.